How do you get a vacuum? What sort of pump? Do you use a vacuum re-filler? I did, I used a standard cooling system vac refiller. I then drew coolant through the header tank and out via the bleed valves using the WIS procedure. Had to do at least 15 liters before I stopped seeing air. Yes, they are good. With 15deg ambient temperature I have 31-35 degree intake temp at full load rising to 45 ish top. Oh dear. That suggests your IC system is working normally. I assume you have a copy of the M275 training document? I suspect you will need to look at the pneumatics if haven't already done so. From memory, there's a vacuum system for the diverter valves and a pressure system for the waste-gates. I would suspect the latter, but I suspect you have already been down that road. Perhaps your engine is trying to protect itself. But from what? I assume your air filters aren't clogged? Have you tried replacing the air pressure sensors on the side of the air filters? They're fragile & vulnerable. The diverter valves do require boost pressure to remain closed, at least on another version of this same turbo that I've worked with (which appears virtually identical...from a Ford Focus ST). So if that's amiss, or the diaphragms are torn, they might be recirculating *some* of the boost pressure. I say appears virtually identical. But I actually used my old diaphragm and spring/cover from the Mercedes in one of those turbos as the one I bought had been used previously with an aftermarket valve and I didn't have a stock valve. So I can confirm that it is in fact the exact same recirc valve including the cover. It does use vacuum to pull it open and is normally closed, but if you don't have boost pressure on both sides of it under boost, it will open at least partially under boost. I do, I posted a link up so that people could download it. I have studied it in detail. Both the boost control section and the divert air systems on my car are working properly. They both hold boost and vacuum for 10+ minutes. If I pinch the wastegate lines then the car overboosts, so 99% sure its the ecu regulating the boost down for some reason. From what is the question! Air filters are brand new OEM MB, maybe 500 miles. all 4 map sensors have been replaced with MB oem sensors. Yes indeed, the divert valves receive boost when under load to help keep them shut, mine are all air tight and working properly. Last edited by Welwynnick; 05-09-2017 at 08:32 AM. There seems to be some misapprehension about diverter valves. The diverter valve is a small alloy piston with a rubber diaphragm that tends to perish with age. The valve is held closed by a coil spring, which pushes against the boost pressure in the turbine volute. The diverter valve is opened by applying vacuum from the Divert Air Switchover valve to the rear of the piston, and that pulls the valve away from the opening, and releases compressed charge air back into the turbine inlet. When the diaphragm splits, the valve fails to open, and you get a surge, and the engine lurches badly. In general it doesn't cause a loss of boost, even when the diaphragm splits. The divert air valves will receive boost when the valve is de-energised and the inlet manifold is under positive pressure. Which is why I mentioned that they both will hold a vac and positive pressure whilst testing, just to make sure there are no uncontrolled boost leaks in there, that's all. 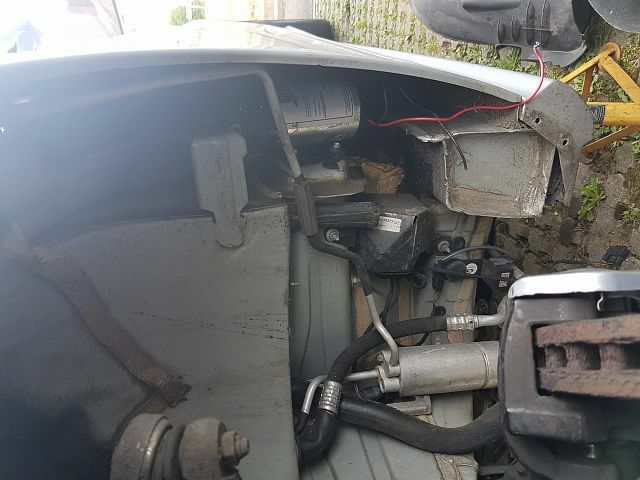 I am going to try and remove the airbox MAP sensors whilst keeping them plugged in, and see if it behaves any differently. Yes, but the divert valves will have boost pressure on both sides in normal running, so the net result is it's the spring that holds it shut, and vacuum that pulls it open. I think you're doing all the right things. 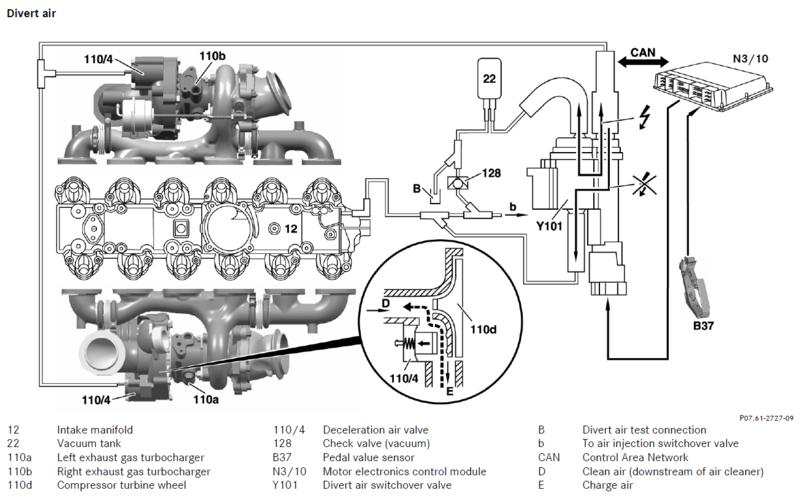 Do you know if your boost control valve is working OK? Are you still misfiring, or just short of boost pressure? Ah yes! I see, so if the diaphragms are leaking, it will just end up with weird on/off throttle response and not necessarily a boost leak. I BELIEVE the boost control valve is working ok, but only due to the boost remaining regulated to 15 PSI after I wound the waste gates in. Star has no way to actuate it on the 221, so I have to find the pin out to test whether it opens and closes fully. I am tempted to put a bleed valve in front of the boost control valve and see if it makes the right boost. Since winding the wast gates back, no misfires, but only mediocre boost too. This is the leaky divert valve diaphragm that I replaced on my first TT. It had plenty of boost, but when shutting the throttle quickly, the turbo surged and the car shook violently fore and aft. it was horrible, and I drove round it by only opening and closing the throttle slowly. There's no possibility of a boost leak there. Could there be anything else funny, like an oil temp sender or coolant temp sender? They're highlighted in the M275 training doc. I would say that has done quite well considering the environment it has to live in. Mine does not do anything like that. I thought that as well, but I drive with the oil temp showing on the dash the whole time and it seems normal. The coolant temp sensor test on star passes as well, and seems to give normal values on my ultragauge when driving around. I am currently in talks with speed driven for diagnosis. Whilst I wait for them get back to me, I have done some testing. Here is a 1500 rpm to redline run in 2nd. Full throttle. I may be mistaken, but my interpretation of those knock values indicate its pulling timing due to knock? Last edited by alexanderfoti; 05-11-2017 at 12:04 PM. Nick, I know for a fact that these cars won't build boost if those diverter valves don't see manifold pressure under boost. It doesn't take a whole lot of pressure to overcome that spring, so that pressure becomes your boost limit if for whatever reason the switchover valve failed closed. I believe it was something like 4-5psi max that my other car would run without a line to the diverter. I agree that a tear in the diaphragm won't cause a boost leak if everything else is functioning correct, but a missing pressure signal to it will short circuit the air path from the turbo outlet back to the turbo inlet and you won't make any significant boost. https://www.youtube.com/watch?v=1xF-pmpTWp8 (this one ran twice). That's sure what it looks like to me. Presumably that would be why it's capping boost as well. So if that is the case, why is it knocking?!? 99 RON fuel (UK). Nice cool intake charge. Engine not overheated. 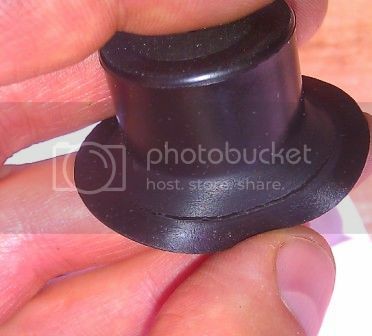 Can worn plugs cause knocking? Has your tuner increased the timing advance? I never logged for knock on mine so I don't know how aggressive the factory map is but I've heard it's pretty tame and shouldn't be an issue as long as your intercooler circuit is working properly. Did you say you've got water/methanol injection as well? If so, see if there's any difference in the values with that active vs without it. I know on a lot of other cars I've worked on, you can get "false knock" just from other engine noise/vibrations. We've had good luck wrapping the knock sensors with dynamat or similar audio vibration dampener. To answer the question about the plugs, I would say no. Larger plug gap will actually result in cooler plug operation due to the shorter duration spark since more of the energy is manifesting itself as higher voltage to jump that bigger gap as opposed to more current/burn time to jump a smaller gap. So theoretically worn plugs would be less prone to knocking/detonation than fresh ones. Unless perhaps you had a lot of deposits on old plugs that were getting hot enough to act as glow plugs. From the plugs I've pulled from my car, I would say it's unlikely on one of these that you have any significant deposits, they appear to run very clean with the twin plugs. Not that I know of. The boost/performance is exactly the same after the remap, but I have asked him for a copy of the map file that is on my car so that I can analyse it. My thoughts are that timing is kept stock and just boost and fuelling is upped. Not many tuners are altering the ignition timing. My Water/meth system is installed but not turned on yet, I would rather not add too many variables into the system. I have read that objects on the engine that are loose etc could cause false knock detection. This engine has 4 knock sensors and it seems pretty consistent across the board, so would be surprised if that is the case. I thought the same. Its possible it has the wrong plugs in it, but I think I am grasping at straws on that one. I need to replace the rocker cover gaskets, so will probably replace the plugs at the same time and see what they look like. What exactly are you guys using for tuning? I would love to be able to do my own instead of being at the mercy of the tight-lipped/secretive US based tuners and not really knowing exactly what they are commanding in my tune. I'm used to doing 100% of the tuning myself. Water/meth should definitely take care of it if it is real knock. What is your nozzle setup? I was having misfire issues with mine, but that was before I replaced the coils. Haven't had a chance to really try it out since. What exactly are you guys using for tuning? I would love to be able to do my own instead of being at the mercy of the tight-lipped/secretive US based tuners and not really knowing exactly what they are commanding in my tune. The story is exactly the same here, they keep their cards close to their chest. I followed a couple of tutorials on you tube for Winols and mapped my C220 CDI that way. They are informative, and with the right map locations, I should be able to see the differences between stock and tuned. The issue with the S class, is getting the map file in the first place. Its hard to read the flash without the right kit. My nozzle is in the y pipe just before the throttle body. Its a 14GPH nozzle with a devilsown pump (Shurflo) and a progressive controller. Everything is plumbed in and installed, I just have to do the wiring. I may try and re-run the test with the meth system on. I thought everyone was using the Aquatec pump these days? Very similar to my original setup, 12gph nozzle in the Y, 300psi alcohol injection systems pump (which apparently is a custom version of the aquatec pump set for higher pressure. I believe it was actually set for 225 or 250 or something). Its possible. Its the old kit I was using on my 215 55. It worked really well on there, but I have had it for 4-5 years. There is so little space on the 221, I had to install inside the front wing!